Peace is lying down, all day long, on a fluffy blanket. It’s reaching out as far as you can and feel your muscles stretch. It’s a ray of sun on your belly, or hands, or even the slight touch of an ear listening to your heart beat. Slowly lifting your head, then noticing that the day’s not over, there’s no food yet, nothing to wake up for. So you lie back down and enjoy the comfortable position you’re in. Peace is scratching that itchy place behind your ear before you fall asleep again. Sleeping it is, for the rest of the day, the rest of the week, the rest of the year for that matter. When this place is no longer enough, you can search for a new place. A chair, for example. A bed, if you see an open door by accident. Even the floor will do. Especially when it’s warm, the cool floor is amazingly nice. Peace is watching your people sit, walk around, eat. When they’re all there, it’s all good. Nothing will happen, food will be there. 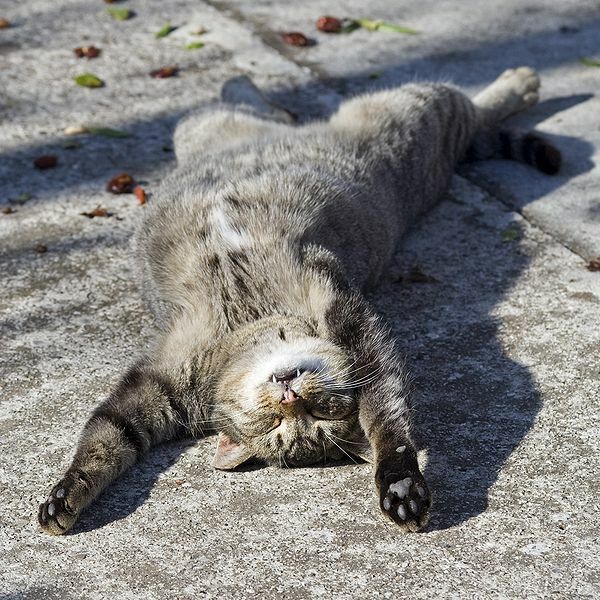 You can roll over, stretch your paws in the air and sleep. Feeling your eyes slowly closing and obeying this gravity. One of the worst things that can happen, is that your sleep is ruined. For example, when you are dizzy and feel like you can’t move your head without feeling like you are falling. Every little move wakes you up. Wakes you from a strange dream in which you can’t remember your phone number (necessary to be freed). And then someone kicks your door open (light! so much light!) and jumps on your bed. He uses you as a pillow. Your ability to move is gone. When you try to move away, just a little bit, from your conquistador, he just rises again and moves back to you, dropping himself against your back. Merciless. I succeeded in escaping my bed – although it must have looked pretty weird – and saw my cat lying exactly in the middle, sleeping peacefully. And poor me, with a head like a balloon, had to move because of no more space. By now I must seem to be a die-hard Metallica-fan. I’m not a die-hard, but I like them, yes. I stumbled upon this song yesterday, because I needed loud music. LOUD but not scream or black metal etc. James Hetfield was what I needed. (And the rest too, but I’m not a die-hard so I don’t know their names 🙂 – shame on me though! ) This songs says exactly what I feel, or rather: I’d like some more sleep :). But no, really, it’s a great song, everyone can see it the way they want. It can be about so many things that it speaks of us all. Sleeping is important, you know. And you dream about what happens to you so you can handle it the next day. Sometimes I really recognize things that happened once and then occur in my dream. But sometimes I wonder why o why I dream what I dream. Sometimes it just seems that my brains are fooling around. Deliveres some good stories the next day :). And surprises you: do I really have that much fantasy? !